Lots of classic cars scream “1950s!”, but few do it louder than the late, great Desoto, former stablemate of Dodge, Plymouth and Chrysler. Certainly, besides Cadillac, no car wore turquoise paint, fins and greenish weather glass better than Desoto. And while this 1956 Fireflite predates the high-flying fins of the ’57 models, its Virgil Exner-crafted ‘Forward Look’ styling hints strongly at the design direction that followed. Frankly, this two-tone head-turner looks so good, I don’t know how much more ‘Longer, Lower, Wider’ I could handle. The design is so pleasing, I pity the engineers who had to change it for a car-buying public eager to have the next big thing. 1956 is something of a sleeper year for American cars, coming one year before the explosion of postwar excess that took fins into the stratosphere, put rockets on the back of cars and grafted Jayne Mansfield’s chest onto the front. 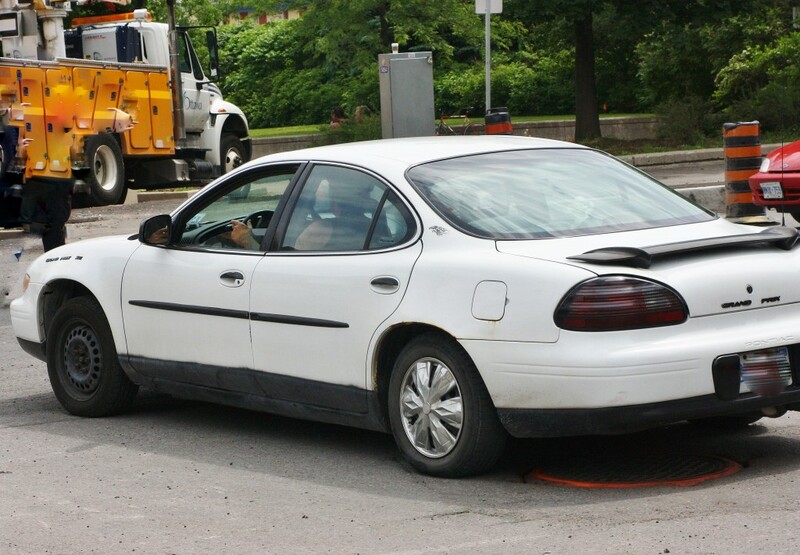 Look closely at this Stratford, Ontario relic and you’ll see twin tailpipes peeking from underneath its shapely bumper. That’s to handle the by-products of a 255-horsepower, 330 cubic inch V-8. The Fireflite was a sales hit for Desoto, which ranked 11th in sales in 1956, a high water mark for the brand. Unfortunately, the writing was on the wall for a make whose roots dated back to 1928. With Chrysler moving from upscale to mid-range in the 1950s following the introduction of the range-topping Imperial, Desoto’s home sales turf was being eroded away on all sides. 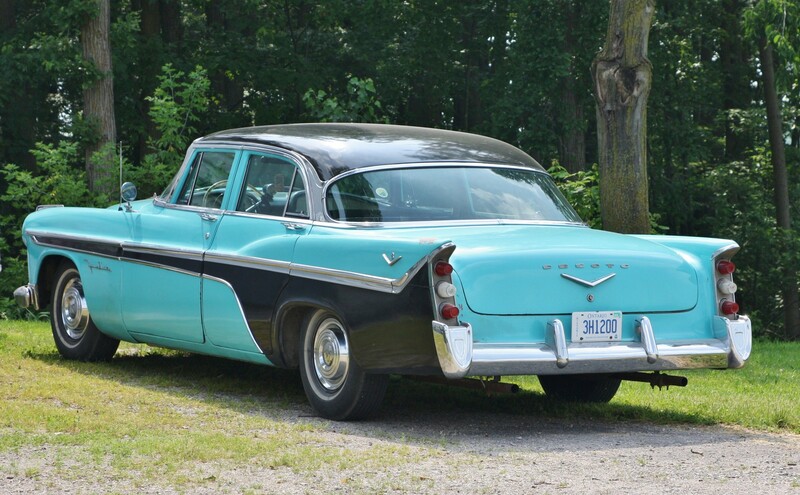 Following an abbreviated sales year in 1961, the Desoto brand was put out to pasture – sadly, just five years after this gorgeous example rolled off the assembly line. 1953 Willys Aero Lark, Hixon, British Columbia. 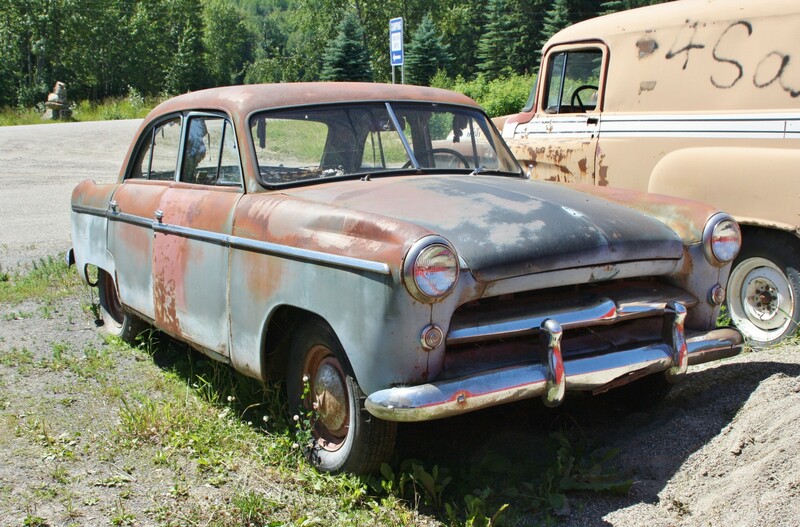 A rarity even in a well-populated junkyard, this ’53 Willys Aero Lark doesn’t garner immediate recognition. A product of Willys-Overland Motors (later Kaiser-Willys), the Willys Aero was produced from 1952 to 1955 before its parent company decided to focus solely on the iconic Willys Jeep. While the Aero received positive reviews for its strong straight-six engines and sturdy, lightweight unibody construction (which earned it a reputation for good acceleration and gas mileage), sales weren’t scorching. The American buying public already had its hands full with the Big Three, and to a lesser extent Studebaker, Packard, Nash and Hudson. While the Willys Aero had a short lifespan in the U.S., the design soldiered on in Latin America after Brazil purchased the tooling to bolster its own auto industry. Willys-Overland do Brasil S.A. churned out slightly facelifted Aeros from 1960 until 1971. “Sweet! You got an FR-S? How did Rachel let you get away with that? Whoa – is that YOUR four-door coupe parked outside? A modern-day enigma that isn’t a sedan – no, no – it’s just a four-door car that’s based on a sedan, but with a different roofline. Doors, schmores – it isn’t the entranceway count, it’s the roofline that makes these babies what they are. Low…swoopy…squished. Whether it’s the Passatt CC, the Mercedes CLS, or the BMW 4-and-6 Series Gran Coupe, the body type (and its annoying terminology) seems here to stay. “So what? What’s the big deal?” you ask. 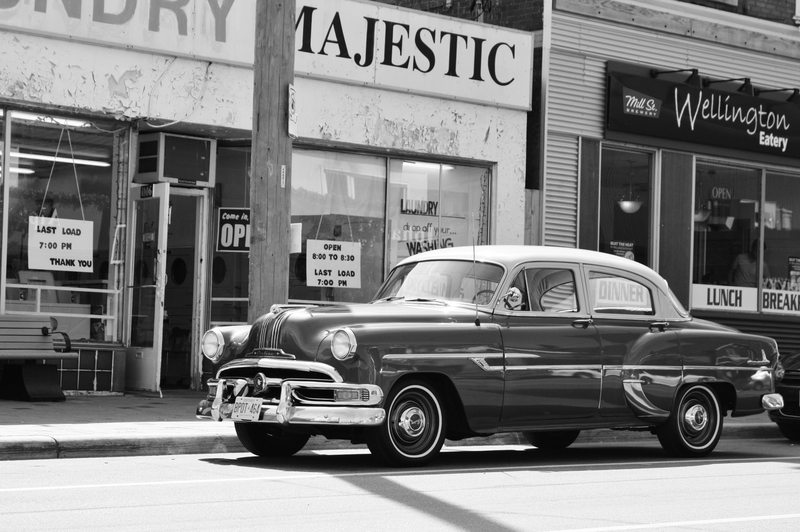 After all, there were ‘2-door sedans’ on the market for decades once upon a time. This is certainly true. However, the term 2-door sedan was meant to differentiate that model from a coupe that was also in the lineup. Usually there was a business coupe or five-window coupe to go along with the more practical 2-door sedan. Think postwar Fords or Dodges. Even as late as the early 80s, you could purchase a Ford Fairmont sedan, a 2-door Fairmont, or the Fairmont Futura coupe, with its rakish, basket-handle roof. The 2-door was just the sedan with fewer doors and no other exterior changes. The Futura was the one that brought the flash to the table (though, with 88 horsepower on tap from both the standard and mid-range engines, not the dash). Why aren’t they just called sports sedans? After all, they’re just a sportier, sexier take on an existing model (or close to it). Well, in many cases, they could be. But, in other cases, the model is derived from something quite sporty to begin with (think BMW), or belongs to a make that has a dedicated trim level for that (think AMG) that can be applied to anything in the stable. Is it all about a rakish roofline? Does this gorgeous specimen count? Granted, there was no other version of Grand Prix four-door in the Pontiac stable. 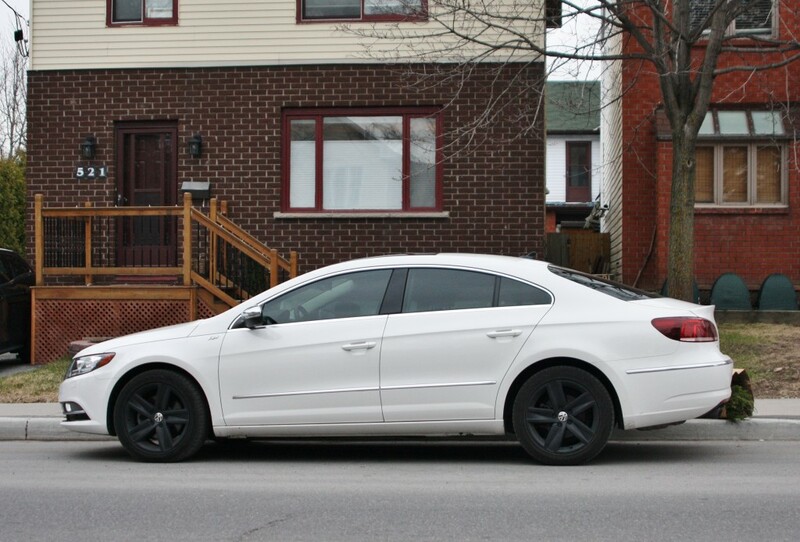 Nor is there a twin brother for the modern-day Ford Fusion or Chrysler 200, with their coupe-like rooflines. Or the new Chevy Impala or Audi A6, for that matter. I guess four-door coupes exist solely to draw another (upscale) model out of an existing, popular model, thus widening the sales net while fleshing out the lineup with a new offering that’s not altogether new. Basically, the reverse of the Studebaker Scotsman of the late 50s, where a new, lower-priced model was created by stripping down the existing Champion. Spreading the Champion into two models to capture the low-priced and mid-priced fields led to a sales boost for Studebaker, enough to carry the struggling company into the 1960s. This entry was posted in Musings on April 26, 2014 by Steph Willems. I hate bumper stickers with a passion, but I’m not sure why. As someone who considers themselves an individualist, why wouldn’t I like seeing a visual expression of personal beliefs plastered onto an automobile? Individualism! Cars! Expression! Bliss! No dice. I despise them even more than finding an errant hair in my meal. The reasons could be many. Much like with Facebook, I really don’t like knowing so much about a random stranger with whom I’ve never spoken. 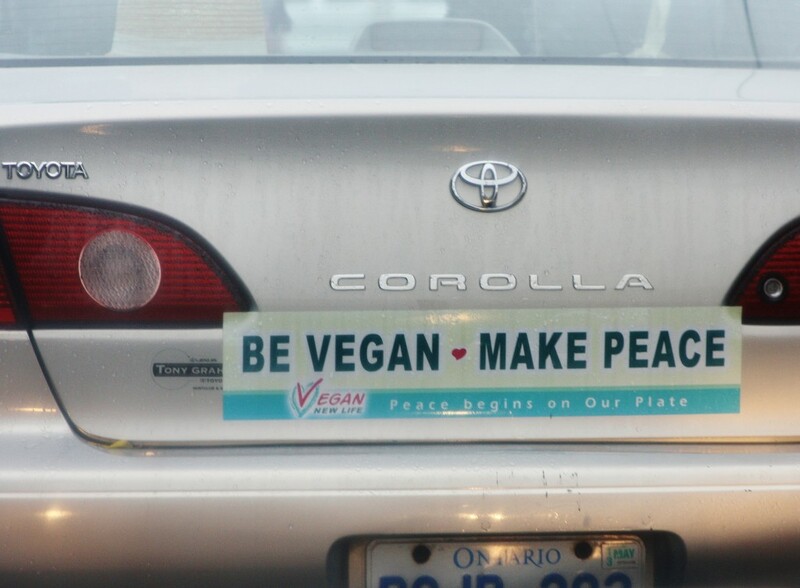 I don’t care about their beliefs, and I certainly don’t want to be told anything by them (or their car). Preachiness isn’t a trait I find pleasing, nor do I like a car’s paint and lines (if it has any) being sullied by a tiny, sticky plastic billboard. Thankfully for me, ‘peak bumper sticker’ seems to be long past. You just don’t see it much anymore – a few Jesus and Darwin fishes here and there, a rainbow flag, and maybe a American voting decision from 6 years ago. Of course, motorists who are real zealots for one cause or another can still make their beliefs readily known through their car’s exterior, and a few dedicated souls still do. It’s just too bad they’re so often affixed to the back of cars, rather than the side. Bad for tailing motorists, but even worse for unsuspecting hitchhikers. No clue as to what the Baja (!) driver or their lifestyle looks like, but you can guess, right? Sharing the roadway with other motorists isn’t exactly a chummy, get-to-know-everyone experience, but there is an element of (often minimal) social interaction, as well as emotional reactions. With driving sometimes serving to bring out the worst in people, bumper stickers can be a good way to confirm whether the stereotypes associated with people who subscribe to certain beliefs have any validity. When faced with the likes of the stereotypical Vermont Subaru driver seen above (the olive-green, diesel Volvo wagon must have been in the shop that day), we automatically conclude the driver is a placid, windbreaker-wearing tenured professor who would brake hard and risk injury to avoid a small snail crossing the road. Naturally, underneath the spare tire, next to the old draft papers from ‘Nam, is his stash. 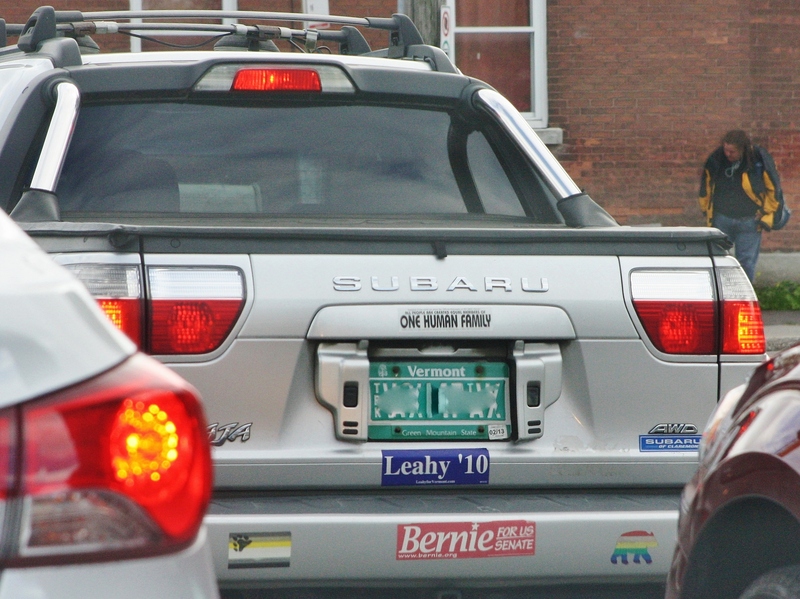 In an odd twist, however, a scientific study by Colorado State University psychologist William Szlemko in 2008 concluded that people with bumper stickers on their cars – regardless of their politics, individual beliefs or interests – were more prone to aggressive driving and road rage than their stickerless counterparts. This entry was posted in Musings on April 22, 2014 by Steph Willems. Late 90s E-Class and circa-1975 Buick LeSabre, Chelsea, Quebec. He was from America, she was from the Continent. He liked Zeppelin, she preferred Ace of Base. Yet, somehow this late-90s E-Class and circa-1975 Buick LeSabre found each other. 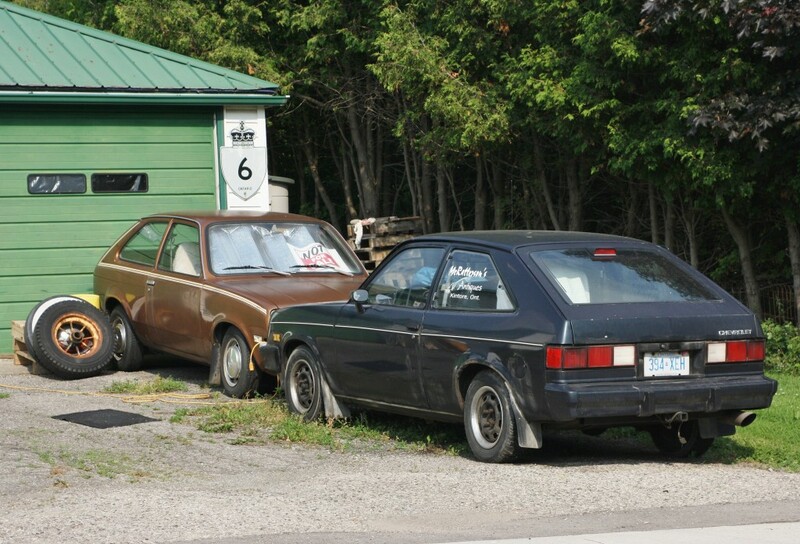 In a west Quebec garage/scrapyard. I always admired the capable, no-nonsense presence of the E-Class, but that Buick is land barge Heaven. A road tank. A square-rigged cabin cruiser, like so much of what rolled off 1970s U.S. assembly lines. Malaise was soaking into the industry in the mid-70s, but this ’75 reflects an era where full-size meant living room, full hardtops and convertibles were still available, and the increasingly emissions-choked 455cid engine option was still on the books. 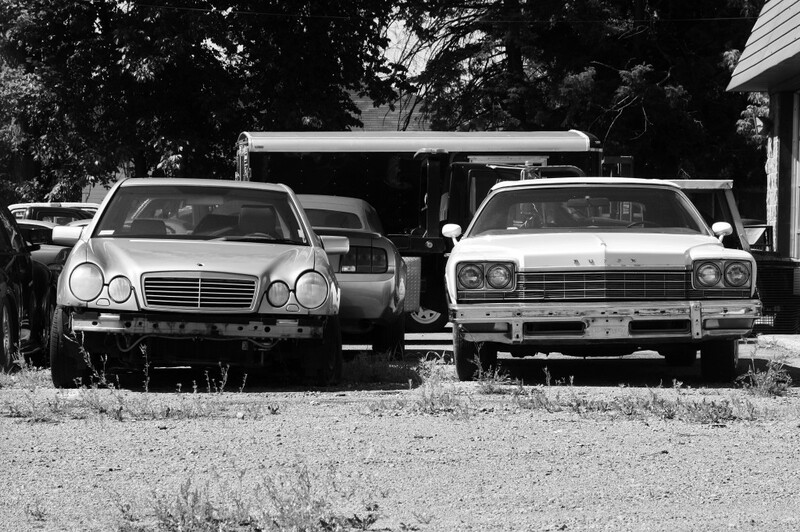 In 1977, downsizing across the entire GM lineup turned those heady days of conspicuous excess into memories. Circa-1952 and 1957 Chevrolet, Ogdensburg, New York. What could be more American than this? 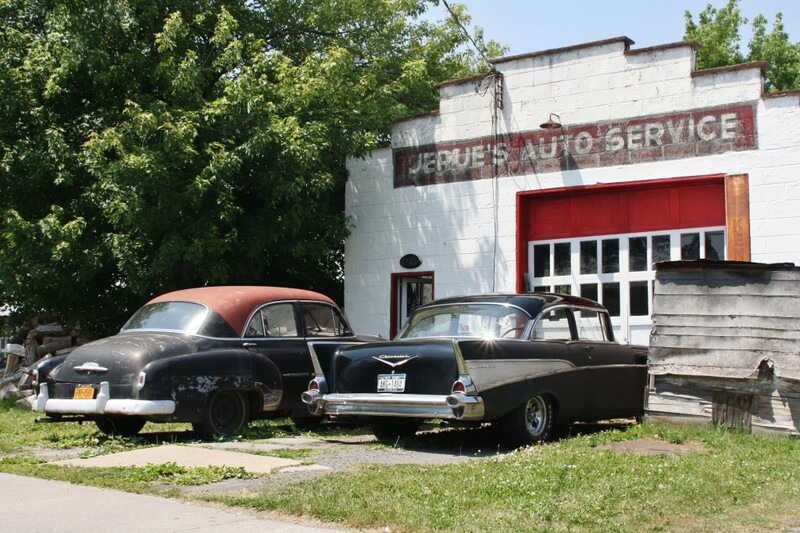 Okay, there’s no baseball in sight, nor is the Stars n’ Stripes waving proudly in the breeze, but this pair of 1950s Chevrolets hold the U.S. end up nonetheless. And that garage – oh, baby, that garage. The 2-door ’57 is clearly the owner’s pride and joy. Black paint deep enough to take a swim in, cataract-forming chrome, not to mention the aftermarket wheels and white-letter rubber. With this level of flash, I don’t think anyone’s going to ask its frumpier older sister to the dance. Still, the ’52 looks like it hasn’t been ignored completely, though I have to wonder about that fading attempt to paint on a sportier roofline. That laundry was never happier. Early 50s styling was conservative pretty much across the board, but this spotless ’52 Pontiac sedan stands out. It’s no Cadillac, but it ain’t no Chevy, either. Liberal amounts of chrome (minus unnecessary, gaudy flourishes) plus a tasteful two-tone paint job compliment this great example of one of the more overlooked American makes of the 1950s. The glaciers have slowly receded following a winter that resembled something from a Roland Emmerich eco-disaster film, exposing formerly icebound treasures to the lukewarm spring sunshine. Such bounty, too! Not just old coffee cups, but also mud, no-longer-frozen dog feces, more mud (I think), and the shovel that went missing after New Year’s. However, on the roads – potholed and cracked as they are – the capital’s weary motorists are thumbing their nose at winter by (cautiously) getting their summer rides out. Last week I rounded the corner near my house to find a red, first-generation Pontiac Fiero parked at the curb. This also would have been noteworthy in July – I mean, who still has one of these 80s relics? The encounter sparked hazy childhood memories for me – especially the recollection of my mother forbidding me from going for a spin in my cousin’s Fiero, which I thought was second only to a Mustang for awesomeness. The reason had something to do with safety – the phrase death trap was tossed about quite a bit that day. Certainly, acceleration-induced whipflash from the car’s standard Iron Duke inline-four wasn’t among those worries. The 1984-88 Pontiac Fiero (Spanish for ‘fierce’, and ‘ferocious’) was far tamer than most drivers would have liked, despite its radical two-seat/mid-engine layout. The reason for this was GM’s need to make do with off-the-shelf suspension and drivetrain parts that formed the basis of such pulse-pounders as the Pontiac Phoenix and Chevrolet Celebrity – not to mention the pavement-scorching Chevette. Not quite a Fiero: still, these Chevettes had more than a few parts in common with their two-seater stable mate. Nothing spells performance quite like the heavy, horsepower-deficient Iron Duke, which, because of tight quarters in the engine compartment, was saddled with a shrunken oil pan that perpetually ran a quart low. In an attempt to squeeze more juice out of this lemon, drivers often revved the Iron Duke too high, leading to widespread breakdowns. Media reports of engine fires served to saddle the car with a stigma that lasted, and GM tossed the hot potato before the 80s were finished. In the end, models with the 2.8-litre V-6 and 5-speed manual were the closest the Fiero came to matching its own high-performance looks. I have to image the little wedge I saw parked around the corner had a V-6 stuffed behind the seats, as I can’t image anyone bothering to keep an Iron Duke on the road in this economy – even for the irony factor. 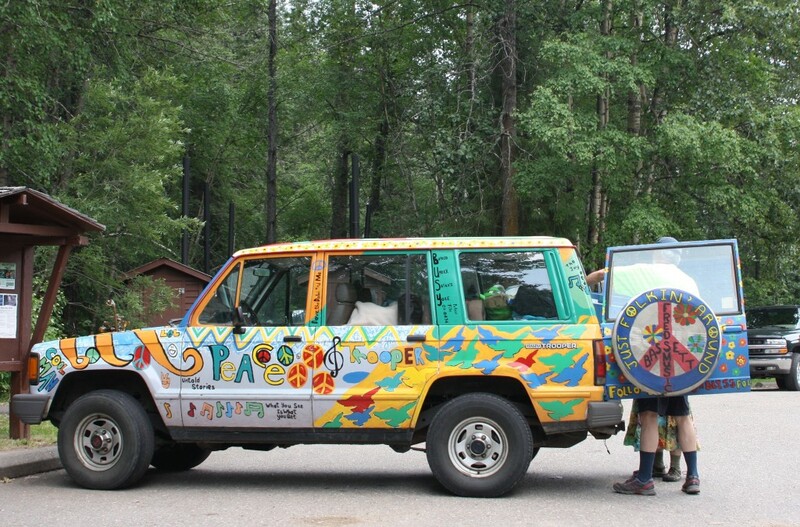 This entry was posted in Musings and tagged Fiero, Iron Duke, Pontiac on April 19, 2014 by Steph Willems.